The choice of Freesat hardware has expanded – albeit not by much – and availability is far more widespread. 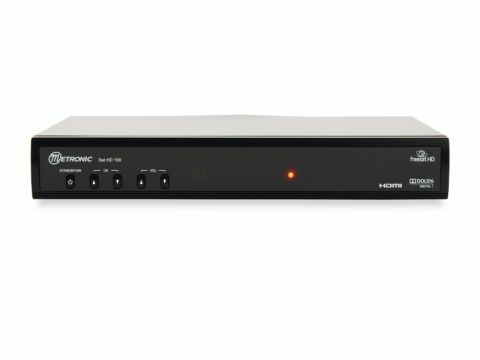 One of the newer entrants is Metronic's Sat HD 100, currently the UK's cheapest hi-def capable unit. Now it's available from Maplin in a DIY package, with dish, LNB and everything else you'll need. Except for the TV, that is. The receiver is well-made, roughly the same size as a box of Black Magic, and is powered by an external 12V DC power supply. It could thus be powered from a 12V vehicle battery – something that might be appreciated by caravanners. Yet it has all – or most – of the features of other Freesat HD units. The front panel lacks a display – all you get is a red LED to indicate standby – but there are tiny buttons for standby plus channel and volume up/down. Menu access from here is impossible; such tasks require the handset. This is almost as long as the receiver front panel, and suffers from an fairly unintuitive button arrangement. The teletext button, for example, is sandwiched between mute and standby in the top row of buttons. On the rear panel are separate Scart sockets for TV and VCR, both of which can deliver composite or S-video (the TV Scart does RGB too). Then there's HDMI, which is active at the same time as the Scart sockets. All modes from 576i to 1080i are supported. Next to the HDMI port are USB and Ethernet ports. The first of these is provided for firmware upgrades and multimedia playback, while the second will in time allow the Sat HD 100 to access on-demand content like BBC iPlayer. This is only a single-tuner unit, but a loopthrough output is provided for another receiver. No UHF connectivity is provided. You get a Dolby Digital-capable optical output but no analogue phono audio outputs. The receiver is rather short of upgrade options. There's no CI slot and you won't be able to convert it into a PVR by plugging a hard drive into the USB port. A key part of the kit is the Freesat-approved 47cm off set dish which, we're told, is made by Triax. With its grey perforated steel reflector, it's claimed to have performance equivalent to that of a Sky Zone 1 minidish and will thus give best results in the south of the UK. It works in conjunction with the supplied Technomate single-output LNB, for which a 0.2dB noise figure is claimed. However, the LNB collar is a standard 40mm fit and so it could be replaced with a multiple-output type if you envisage installing more Freesat (or, for that matter, Sky) receivers around the house. In keeping with the system's self-installation ideals, the package also includes a compass (for azimuth determination), 20m of co-ax, F-plugs and instructions. The latter are very basic; conspicuously absent is a table containing Astra 2x elevation, azimuth and LNB skew angles for major UK towns and cities. Still, you could always take up the accompanying flyer's offer of a professional installation.